Note: I baked these in 4 small, oven safe ramekins but you could adapt this recipe to a casserole pan pretty easily, I would think. Or you could use a muffin tin instead. Preheat oven to 350 degrees Fahrenheit. Pull up a sheet of phyllo dough and rip it in half. Place in the ramekin so that some hangs over the side. Brush with melted butter. Add another layer of phyllo crosswise over the first. Brush with butter. Add a third layer of phyllo on top of the first two and brush with butter. Repeat the process with the remaining ramekins. In a mixing bowl, mix together the eggs, cotija, scallions, cilantro, salt and pepper. Go easy on the salt since the cheese is salty. Once everything is well mixed, pour the filling into the individual ramekins, then fold any overhanging dough onto the top of the filling. Place in the oven (I put mine right on the oven rack) and bake for 15-18 minutes. 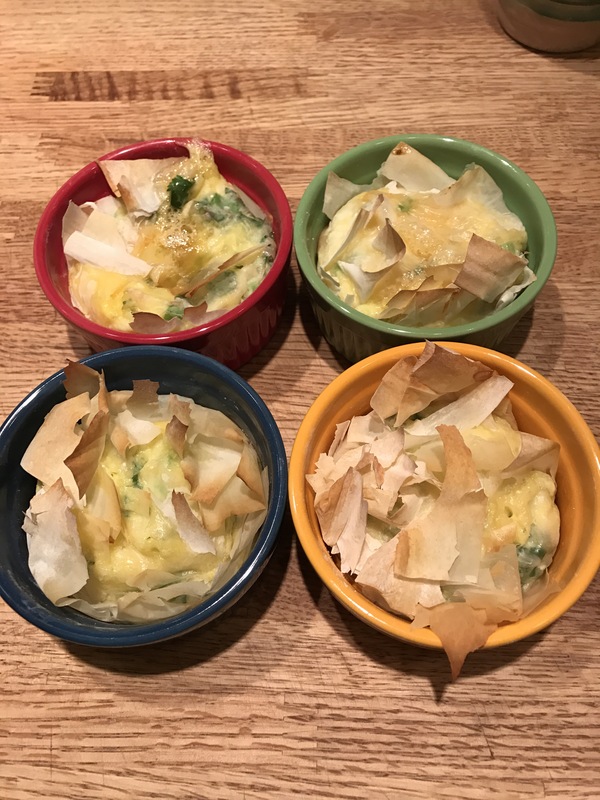 Once the eggs are set and the phyllo is browned remove from the oven and pop the little egg filled pdoufh cups out of the ramekins. 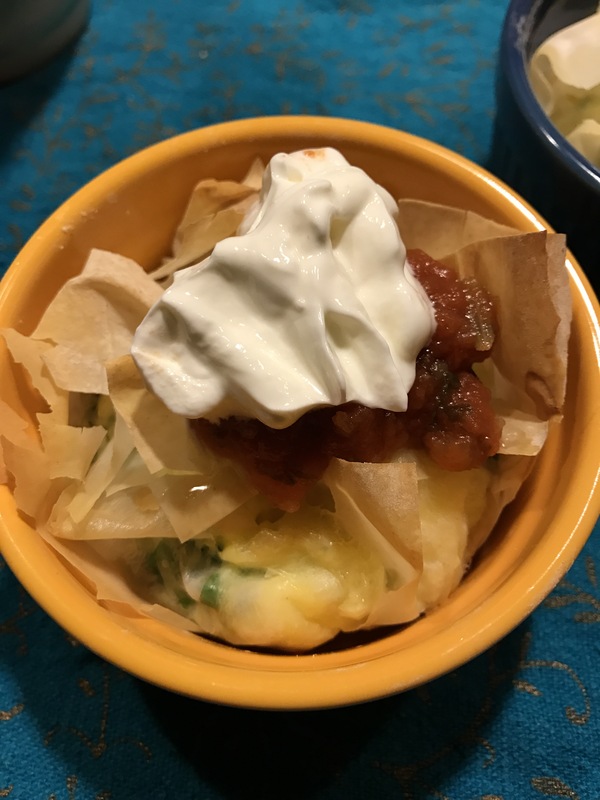 Top with sour cream and salsa and eat. The great thing about this recipe is it’s easy, fast and endlessly variable. You could do goat cheese and leeks. Bacon and blue cheese. Cheddar and sausage. And the best part? My son ate it and liked it.